« Why isn’t there a gate at Gates Circle? 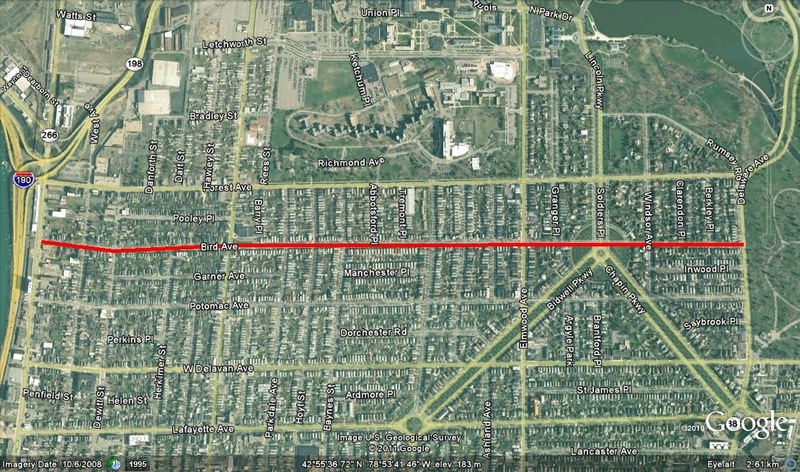 Bird Avenue runs approximately 1.5 miles between Delaware Avenue and Niagara Street, just south of Forest Avenue. Colonel William Bird was born in Connecticut in 1797. He spent a year at Yale, but decided that he was more interested in engineering than greek and latin. During the War of 1812, he served with his uncle, Peter Buell Porter (a very important man in his own right, but we’ll get to him another time). He became a Colonel and assisted General Porter with the boundary commission that determined the boundary between the U.S. and Canada in 1817. When he came to WNY in 1818, it was only natural that he settle in Black Rock, where his uncle lived. He built a large house at 1118 Niagara Street (near where Rich Products is located today), on the west side of the street, with the Niagara River as his backyard. When the foundations of his home were being dug, a large brass kettle was found. In the kettle were 12 skeletons, each with a hatchet in its head! The bodies are believed to have been those of a lost party of French Explorers who were heading to Detroit in 1763. It is believed they were sleeping by their fire when surprised by natives americans. Col. Bird lived in his house on Niagara Street for 58 years. Upon arriving in Black Rock, Col. Bird built WNY’s first flour mill. The mill ground the first cargoes of wheat that came across the Great Lakes. He served as Government Inspector of Marine Navigation for the Great Lakes and the code of rules he established for boats is still valid today. He laid out many of the streets of Black Rock and built many of the earliest mills along the Niagara River. These mills were run by water power. He was one of the builders of Black Rock Harbor and its piers. He was president of Erie County Savings bank for 24 years. He was a founder of the Buffalo Niagara Falls Railroad and superintendant of its construction. He died in 1878 and is buried in a family plot at Forest Lawn Cemetery. Sources: Smith, Perry. History of Buffalo and Erie County. D. Mason and Co, Publishers: Syracuse NY, 1884. “Bird Avenue named after Col. William A. Bird.” Courier Express July, 31, 1938. section 5, p.3. Clipping found in BECPL Buffalo Streets Scrapbook, Vol 2.